FISHO VOICE is a monthly magazine of Odisha Fisheries, Cuttack. They had featured my crab recipe in their magazine on their 46th Anniversary Celebration. Robin and Bob Young, the cooking enthusiasts, have a large collection of recipes in their website http://boisefoodieguild.wordpress.com. They focus on the world recipes and have won several awards for their blog. Boisefoodieguild have been selected Blog of the Year consecutively in the year 2012 and 2013. Urbanspoon has ranked Boisefoodieguild as rank #7. 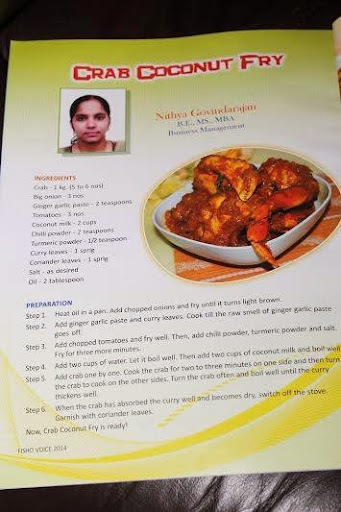 They let me know early this year that they have recommended Nithyas Corner in their website for the collection of Indian Recipes. They have very few blogs recommended on their side bars, and I was more than happy to see my website recommended there. Thank you Robin and Bob! This was the last contest I participated and never got the opportunity to participate again. I should say I did not find time. Is it an excuse??? (Oh..no, I mean it!). Did not find time at all. 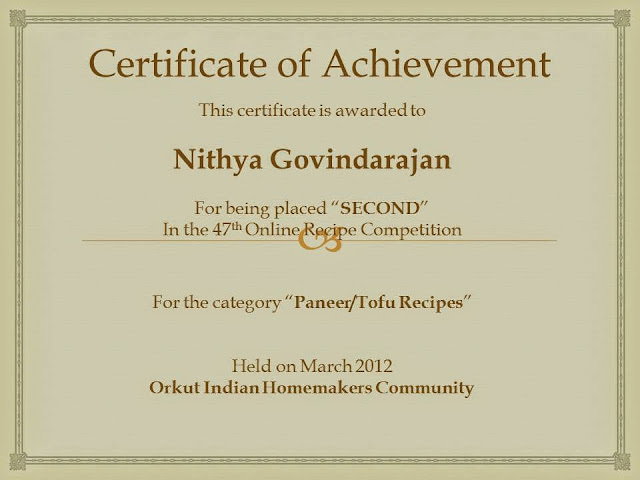 The contest was about “Paneer/Tofu” recipes. Again, I came to know about the contest only in the last minute. Palak Paneer fetched me the second place. I felt quite happy because during the voting, Palak Paneer was wavering between 1st and 2nd position. By a very few margin (I think 3 votes), I came second. Another hurray moment for me. 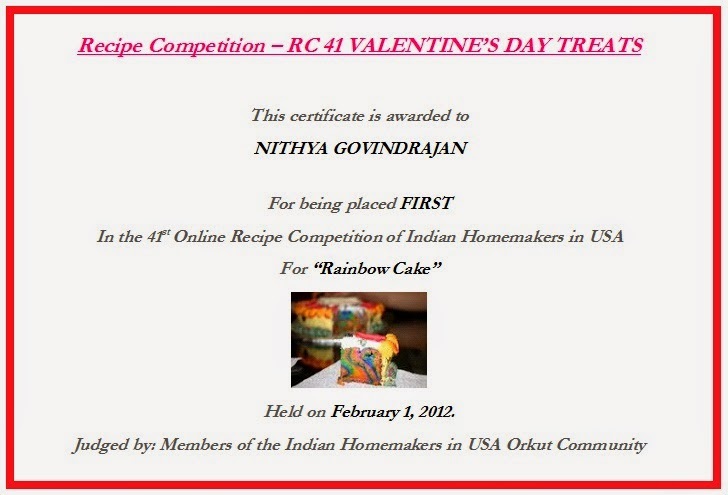 I got the opportunity to participate in the recipe competition second time. The theme was “Kebabs”. I did not have enough time to prepare for this competition. May be had only a day or two…then, I decided I will try HARA BHARA KABAB. I contested and again won the competition. I should say my confidence boosted in this competition. Then I never wanted to look back. Whenever I have surprise guests at home, I make this recipe. 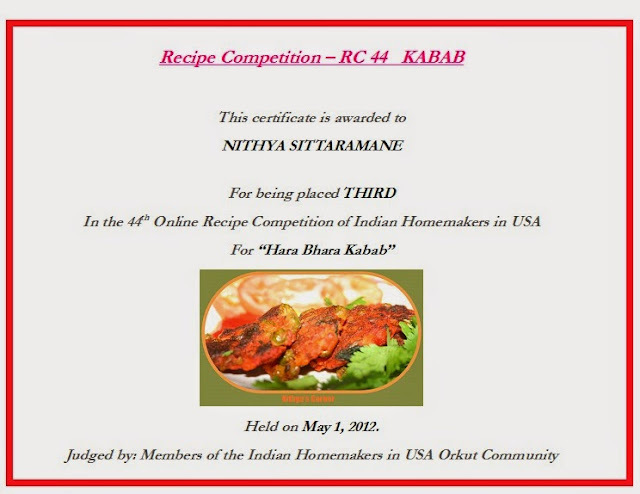 Whenever I make or eat HARA BHARA KABAB anywhere, I will remember about this competition and the award. Definitely a proud moment for me. When Sanvi was two months old, I wanted to document my recipes and put them all in one place. When I was thinking about this, my friend called me and asked me to participate in a recipe competition. Initially, I hesitated and then contested. The topic was Valentine’s Day Treats. I submitted my RAINBOW CAKE recipe but the moderators suggested that I post from my blog. In order to participate in the contest, I took strenuous efforts in baking and decorating the cake. I did not want my efforts to go futile. Believe me or not, I opened my blog “Nithyas Corner” at midnight 2am. I just wanted to participate in the competition. Within a matter of few seconds, I decided that my blog should be named as Nithyas Corner. I wanted to store my poems, photography, crafts, paintings, recipes, and articles all in one place. Hence, I chose the blog’s name as Nithyas Corner. By 4am, my blog was ready with the post. I contested and then won with a large margin of votes. My happiness knew no bounds. I thanked my friend, and after a few days, many urged me to continue blogging. I also started getting interest on blogging about food, and till date I am doing it with a lot of happiness.